Similar to the Day 1 GM Diet where you’ve been on a strict fruit-only diet, the 2nd day is limited entirely to vegetables. You can eat all sorts of vegetables on the Day 2 of the GM Diet and there is nothing to avoid in the veg-section. 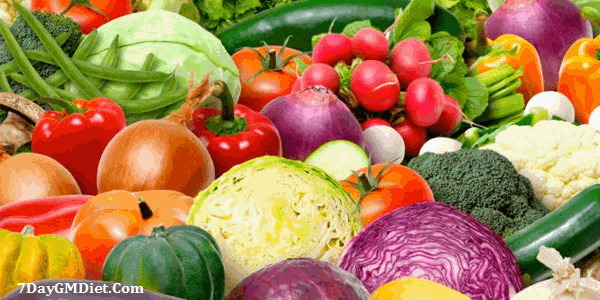 By eating vegetables, you’ll be getting more fiber and they also help in regulating the sugar content which is deposited on the Day 1. Here are a few GM Diet vegetarian recipes you can try on the day 2. How to Prepare Your Body for GM Diet Day 2? Unlike the first day where you would feel lightheaded due to less intake of carbohydrates, Day 2 would make you feel much better. So, you should eat more Melon for the dinner on Day 1 so that the energy you gain from eating the dinner will last long until the second day of the diet. Unlike in day 1 where you’re restricted to eating Bananas, on Day 2 you can have almost all vegetables even those rich in starch, such as potatoes. The second day routine will give your more energy and you can also perform strenuous activities and HIIT exercises if you wanted to. Breakfast: Start your breakfast with a large boiled Potato and it would keep your stomach full as well as the body gets energized for the rest of the day. People who live in the tropical countries may consider Cassava or Sweet Potato instead of the regular Potato. However, they should be careful not to add any sugar to the meal. Lunch: This should be lighter. You can have vegetable salads made of Cucumber, lettuce and Cabbage. You can also dress your salads with Vinaigrette or Olive oil but not to use Mayonnaise as it would add some extra fat. Dinner: You can have fresh greens that include Broccoli, Cabbage, Lettuce, Asparagus and Cucumber. Additionally, you can have boiled beets but many feel beets to be heavier on their stomach. Along with these, drink enough water throughout the day. 2 Tomatoes or 1 cup Cherry Tomatoes and drink 2 glasses of water. Boiled Broccoli, Cauliflower and Asparagus with salt and spices and drink at least 2 glasses of water. No fruits at all. As you already have sugar from your Day1 diet, you don’t want to add any more. Don’t add oil for cooking as much as possible. In case if you still want it, try to use 100% natural butter or virgin olive oil. You can have the Cabbage soup whenever you feel hungry. Couscous is a traditional dish which is famous in the North African cuisines of Morocco, Tunisia, Algeria, Mauritania and Libya. It is also voted as the 3rd most favorite dish of people in France. Coming to the nutritional benefits, the Couscous has about 3.6 g of protein (calcium & iron) for every 100 grams and it contains a 1% fat-to-calorie ratio. How to Prepare Tunisian Vegetable Couscous? Put the couscous in the bowl and pour the hot vegetable stock. Stir it and leave it aside for about 8-10 minutes for all the liquid to be absorbed. 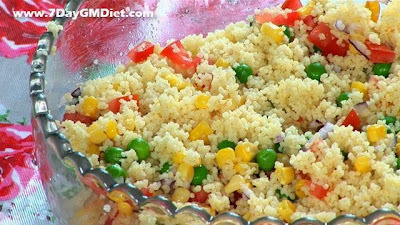 Now, just mix up the couscous a little bit and add all the other ingredients such as peas, chopped onion, tomatoes, sweet corn. Give it a good mix and serve it hot. A simple to make delicious vegetable couscous which contains all the healthy nutrients your body needs. Have you successfully completed the GM diet Day 2 regimen? Then you’re good to go through the Day 3 GM diet regimen.